The nearly 350,000 acre San Gabriel Mountains National Monument was dedicated in October 2014 by proclamation of President Obama, after more than 10 years of work for its establishment. The monument covers the northern and eastern regions of the San Gabriel Mountains, primarily in the Angeles National Forest. Within the boundaries, vast wilderness areas like the Sheep Mountain Wilderness, the San Gabriel Wilderness, and Pleasant View Ridge Wilderness exist very close to the urban sprawl of Los Angeles. Most of the major peaks of the San Gabriel Mountains, including Mount San Antonio, Mount Baden-Powell, and Throop Peak are also protected. The area is also home to many interesting plants and animals, like California’s endemic Bigcone Douglas-fir (Pseudotsuga macrocarpa). 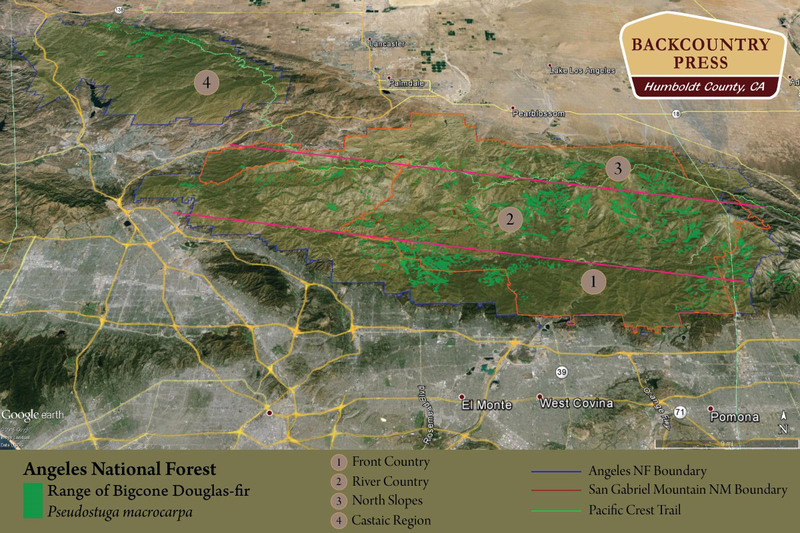 In 2015, CNPS began a project with the US Forest Service (USFS) to map and survey Bigcone Douglas-fir within the Angeles National Forest. Daniel Hastings, Julie Evens and I embarked on this project along with USFS staff in the fall, spending most of November in the range, collecting data and ground-truthing populations of trees. After nearly a month of travel through one of the gems of Southern California, I’ve had time to reflect on all aspects of the journey–including the wonders of the wilderness and forest, as well as the state of the region. The San Gabriel Mountains remain wild, in large part, because of isolation due to slope. In fact, John Muir called them the steepest mountains he ever hiked in! The forests of the San Gabriels are mostly healthy. It seems to me that the forests here are doing as well as they are, while our climate is rapidly changing, because of plant isolation within slopes. Forest pathogens travel much more slowly through heterogeneous landscapes with mixed stands of trees. Many of the Bigcone Douglas-fir stands we visited were isolated on slopes of greater than 45°. Isolation sculpts the ecology of the mountain’s biota in many ways, and makes life for this conifer both easier and more difficult. That balance also defines the ecological amplitude of many of the species within the California Floristic Province. We are still working on a full report of our findings, but we did see some broad landscape-level patterns in Bigcone Douglas-fir’s health and vegetation associations. Within region 1 of the map below, Bigcone Douglas-fir trees are exhibiting high mortality. Elsewhere, they seem to be doing fine at the moment–especially in forest areas that have been able to avoid high intensity fires. Reproduction is occurring at variable rates, but they seem to like disturbed areas, like landslides, which the San Gabriels have no problem offering. Populations are often small and isolated–and while being continually exposed to increasing warmth and decreasing rain–appear to be getting smaller still. It has also been proposed that smog is playing a role in the species’ decline as well. High mortality was witnessed here–it is a tough place for many species to survive. This must be the wildest country Los Angeles County has to offer. Visitors are few and wildlife and forests seem to be thriving. Forests are healthy and Bigcone Douglas-fir reproduction is common along the washes and other areas where landslides are frequent. Bigcone bark and views across the San Gabriel Wilderness. High intensity fires often do not impact the north slope forests as much as the south slope, where chaparral is common. Where the forest meets the high desert, interesting plant associations can be found–literally where the California Floristic Province ends and the rain shadow begins. Forests of Bigcone Douglas-fir are generally healthy except a few stands at lower elevation or on occasional south-facing slopes. Bigcone, Arctostaphylos glauca, and Cercocarpus ledifolius. Some forests survived on the North Slopes of Mount Gleason after the Station Fire. I had never been to this hidden corner of the Angeles National Forest and was pleasantly surprised with what I found. Spectacular black oak woodlands decorate ridgelines with chaparral-covered south slopes and fir-covered north slopes. Bigcone Douglas-fir was acting like its more common relative, Douglas-fir (Pseudotsuga menziesii), at the edge of meadows where fire suppression and wetter years have allowed them to “encroach” in the oak woodlands. This was the only place in the Angeles we have seen this “invasive” behavior in Pseudotsuga macrocarpa. Bigcone Douglas-fir are “invading” oak woodlands at the edge of the Mojave Desert with the Tehachapi Mountains in the distance. Stay tuned to read more about our findings. We are scheduled to wrap up the project in late 2016. MICHAEL KAUFFMANN is an author, educator and ecologist who lives in Humboldt County with his wife Allison and son Sylas. He is author of three books: Conifer Country (2012), Conifers of the Pacific Slope (2013), and Field Guide to Manzanitas (2015). Follow more of his plant explorations at www.blog.conifercountry.com.